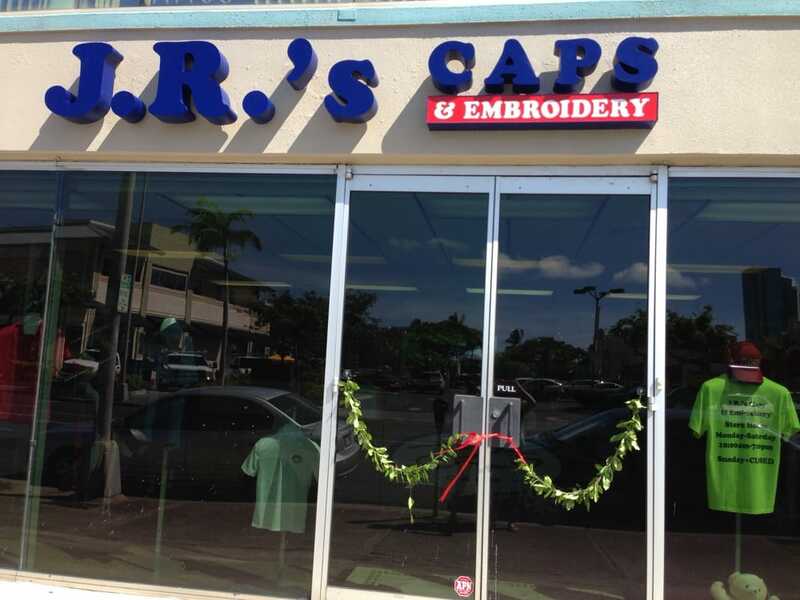 J.R.’s Caps & Embroidery started as just a small kiosk called U Think It, We Print It in Windward Mall in 1994. We only offered iron-on flock lettering and patches. We also opened a kiosk in Sears Ala Moana as a Holiday concession for Father’s Day. Business was so successful that we decided to open our own store in the mall and a larger spot in Sears Ala Moana, and ventured into embroidery. This made us the first retail embroiderers in a mall in the state. We decided then to close down the Windward Mall store, and work exclusively out of Sears. In 2006 we bought the first direct-to-garment printer in Hawaii. Due to Sears closing its doors, we had to find our own store, and are now located at 320 Ward Ave #116. We are a locally owned and operated small business. We take pride in our ability to provide our customers with quick turnaround, no minimum embroidery and garment printing services. In the past 24 years, we have serviced many local businesses, high schools, hotels, military, HPD, HFD, and movies such as Battleship and Journey 2, as well as TV shows such as Lost and Hawaii Five-0.